I have lived in San Diego since 1965 when my family moved to California from Pennsylvania a few years after my father passed away. I was raised in the Catholic church and attended Catholic school through 8th grade. Our family’s finances did not allow for all of us to attend Catholic high school so I was enrolled in the public school system and attended Helix High School in La Mesa. Though I was raised in a believing home, and knew the things of God, I quickly began to live a lifestyle that was contrary to God’s best for me. Drinking and partying became a habit. During this time I picked up the acoustic and bass guitar and began to play music in high school rock bands. My desire was to become a ‘rock star’ and become rich and famous. When I was 18 years and 1 second old I literally walked away from everything I was taught and believed about God and began pursuing a potentially destructive lifestyle. After graduating high school I moved to Los Angeles to try to break into the music industry. I had written a song that I was sure was going to propel me into stardom. I quickly learned that achieving fame is hard work and I did not have what it took to become famous. Settling in the San Fernando Valley I grew my hair (longer) and began to hang around with some bikers. My weekdays were spent working and my nights and weekends were dedicated to riding my chopper, drinking and partying. Pursuing a relationship with God was the farthest thing from my mind. In 1977 I received a call from a friend of mine whose band was looking for a new bass player. I quit my job in Burbank and moved back to San Diego where I moved in with a girl name Vicki (who eventually became my wife of 39 years). The band I joined played clubs and bars, and I worked during the day to supplement that income. Vicki and I married in 1978 and the band went on the road playing clubs up and down the Pacific Northwest. In 1979 we had our first child, Joshua, who was born with Down Syndrome. Our daughter Robin followed a year later. At this time I quit the band to stay home and for the next several years worked a variety of jobs. Music took a backseat in my life. In 1982 I was hired by the USPS and worked ‘graveyard shift’ for many years. One morning in August 1984 on the way home from work I was listening to a Christian radio station and the preacher gave an altar call, asking any listener who wanted to accept Jesus as their Savior to respond. I responded at the intersection of Washington and Jamacha in El Cajon. Immediately after I said ‘yes’ to Jesus I felt as if a burden was raised off my shoulders. I felt physically free. I had peace in my heart. I was filled with joy. I knew that being a good Christian meant that I needed to go to church. My wife and I began looking but could not find anything. Then my friend Larry (who was the one who called me about needing a bass player) introduced me and my wife to Pastor David Hoffman, and we began to attend David’s home group and church. I would bring my bass and little amp with me and accompany Larry as he led worship. I also was blessed to play bass at the Sunday services. One Sunday the regular worship leader was not there and I was asked to fill in. I was so blessed to lead the church in worship. Eventually Pastor David and Pastor Mark’s churches merged and I served on the worship team for the new church. 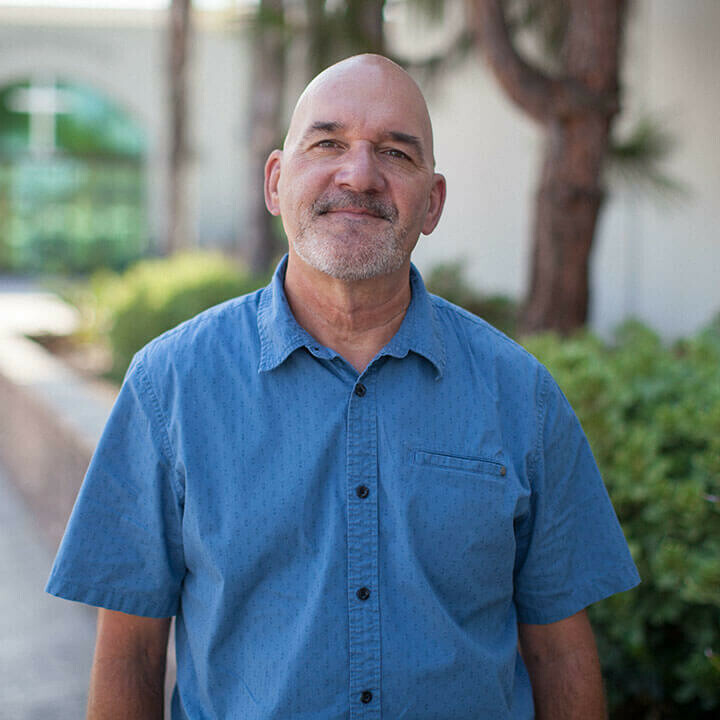 The worship leader at Foothills had to relocate to Orange County and in the summer of 1988, at the church picnic, David and Mark asked me to become the worship leader of Foothills Christian Church. I have served in that capacity for almost 30 years. I have been blessed to attend Foothills for over 33 years, have my children be a part of the ministry at Foothills, and now see my three grandchildren actively involved at Foothills. Psalm 37:4 says “Delight yourself in the Lord and He will give you the desires of your heart”. Before I gave my life to Jesus, my ‘desire’ was to use the musical gift He gave me to bring glory and honor to myself. When I made the decision to delight myself in the Lord, and make Him the reason and motivation for everything I did, He responded by giving me a platform to play music (for literally thousands) that served Him and His purposes. He provided me an opportunity to make HIM famous through leading people in singing songs to Him. That we would actively seek and understand the plans and purposes God has for our lives, and that we would bring glory to Him when we fulfill them!